Formerly housed in Cardiff's Pumping Station, Lord & Butler Model Railways doubled in size during the summer of 2013, relocating just a "stone's throw" away to new premises and undergoing a complete re-branding. We carry in stock a huge range of over 5,000 products including new locomotives, coaches, wagons and train sets in 00 Gauge, N Gauge and many others. In addition we stock large quantities of exclusive and limited edition models, plus we always carry a selection of collectables and second hand products. 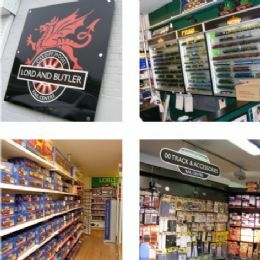 Lord & Butler carries stock by most leading UK and world recognised model railway brands inclusing Hornby, Bachmann Branchline, Graham Farish, Dapol, Peco, Kato and Gaugemaster amongst others. For the modelling enthusiasts we hold a huge selection of scenery, materials, tools and scaled buildings. Pic. Photo images of Lord & Butler Model Railways, Cardiff.